Enjoy this full expository commentary on the New Testament! 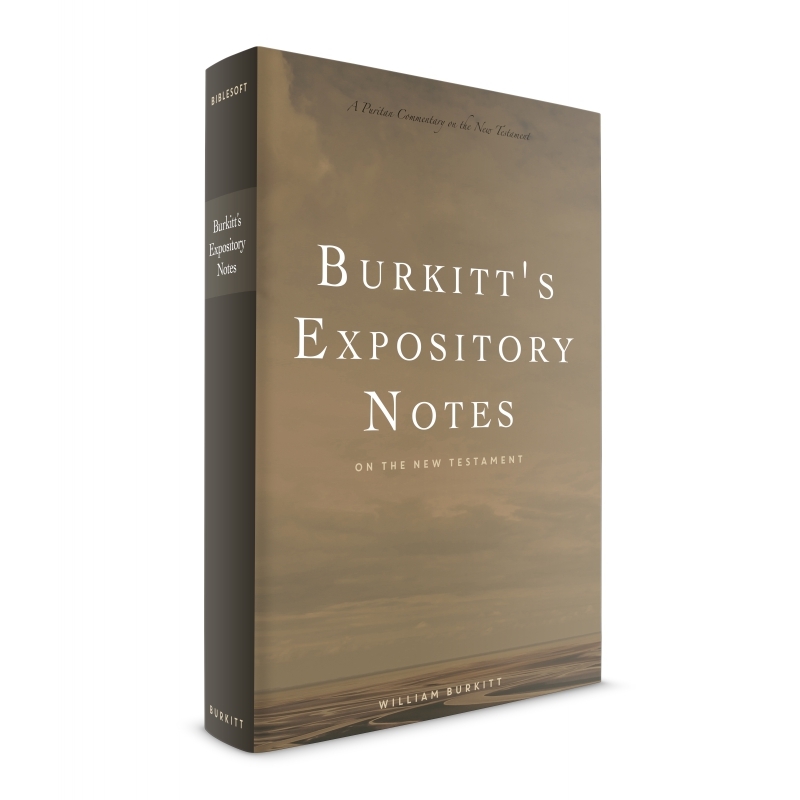 William Burkitt, noted 17th century biblical scholar and expositor, shares his practical observations in this verse-by-verse commentary of the New Testament. Covering all 27 books of the NT, he leaves no chapter unexamined. 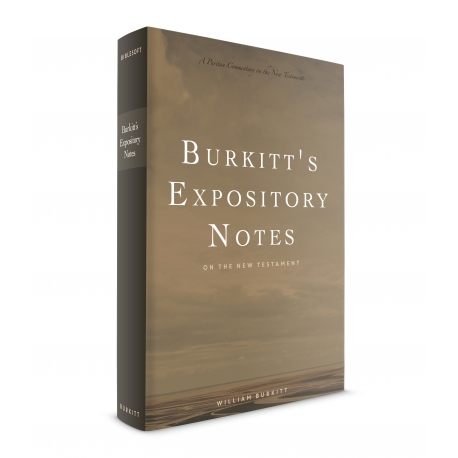 Burkitt's unique take on expository writing is both refreshing and simplistic. He takes a verse and intricately breaks it down while providing many 'practical observations' into convenient bullet points. This approach provides a form that will cause the reader to examine even the smallest detail of a verse that otherwise may be missed in a cursory reading. Burkitt's style is praised by many contemporaries for it's readability. His expository notes were even known to be used by many families as a daily devotional due to it's wide appeal. Observe here, John's character, and the people's carriage. 1. John's character; he was a light, a burning and a shining light: he had in him a light of knowledge, to enlighten, direct, and comfort others; and this his knowledge was accompanied with zeal: he was aburning light in his doctrine and a shining lamp in his conversation: he had the light of knowledge in his head, the warmth of zeal in his heart, and the influence of both in his life. Learn hence, 1. That those whom God calls to the office and work of the ministry, he furnishes with abilities and endowments suitable to their great employment, he endows them with a light of knowledge, which is animated by the heat and warmth of zeal. 2. That ministerial gifts and abilities are not bestowed alike upon all, but dispensed variously. All are lights according to their measure, but all are not equally burning and shining lights for proportion and degree. 3. That the brightest burning and clearest shining lights in the church of Christ, have but their time in this world; they are subject, as well as other men, to the common condition of mortality, and the lamps of their lives burn out the faster, by lighting others to heaven. John was a burning and a shining light; but now is put out and gone. Observe, 2. As John's character, so the people's carriage; Ye were willing for a season to rejoice in his light. Here is a three-fold gradation; they rejoiced, they rejoiced in his light, and they rejoiced for a season. 1. They rejoiced. The word signifies, they leaped for joy, and danced about him as children do about a bonfire, when he first began his ministry among them. O, how warm are the affections of a people, when a pious and zealous minister comes first among them. 2. They rejoiced in his light, not in his heat. Or, they rejoiced in John's light, not in Christ's; for when they found that John bare record to Christ, they soon grew cold in their affections towards John. 3. They rejoiced only for a season; for an hour, as the word signifies. For a short time John's ministry was acceptable. Learn hence, 1. That it has been an old practice among the professors, not to like their pastors long, though they have been ever such burning and shining lights. John was not ever such burning and shining lights. John was not changed, but his hearers were changed; he did burn and shine in the candlestick of the church with equal zeal and lustre to the last: but they had changed their thoughts of him, and lost their esteem for him. Learn, 2. That as nothing in general is so mutable as the mind of man, so nothing in particular is so variable as the affections and opinions of people towards their ministers. The lamp of John's ministry was always alike burning and shining, his oil did not waste, but his hearer's zeal wasted, and their affection cooled: those whose gifts are not all abated, may yet find a great abatement in the acceptation of their gifts: therefore let no man live upon the breath of men; least of all let ministers live upon the popular air, or the speech of the people. O, let us live upon the credit which we have with God, and rejoice chiefly in his esteem. If our performances find acceptance with God, we are safe and happy, though they fall under contempt with men.